And now begins the season of adorable festive crafts!! You are definitely going to want to check in each week to see what fun tutorials we have in store! We're starting off with a bang. 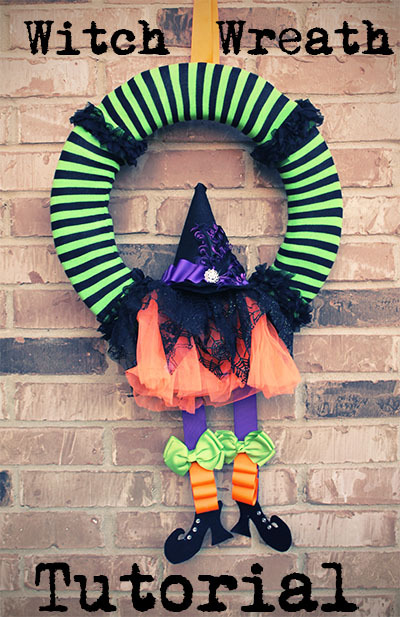 This Halloween witch wreath is so cute, you won't believe that you can make it yourself! We have taken the time to carefully number our photos so that the tutorial is as easy as possible. At the end of this post, you'll find links to all of the items that can be found on our site. Step 2 and 3. Cut your wreath in half. Step 4. Put the legwarmers on your wreath. NOTE: We ended up going back and wrapping our styrafoam with batting so that it didn't look so "boxy." You can buy a round wreath to begin with or do what we did. Step 5. This is what it'll look like when you've wrapped your wreath in batting and all four legwarmers. Step 6. Now you're going to need to make your wreath into one piece again. Use some hot glue to attach them, and then hold them in place with some duct tape. (Yes, we use pink duct tape. We are The Hair Bow Company, what do you expect??) Do this on both sides, making sure your wreath feels solid again. Step 7. Pull the batting and legwarmers back in place so your wreath appears seamless. Step 8. Measure out about 18 inches of purple ribbon. You'll probably need to trim it later, but it's always better to measure too much! Glue it to the backside of your wreath and make it lay over. These will be the witch's legs. Step 9. Repeat to make the other leg. Step 10. Measure about a foot of orange ribbon. This will be the witch's socks. Step 11. Create ruffles with the ribbon, adding a line of glue to secure each ruffle to the purple ribbon. We made three ruffles and then trimmed the extra ribbon away. Step 12. This is what your wreath should look like at this point. Step 13. Clip your lime bow to the top of the sock. 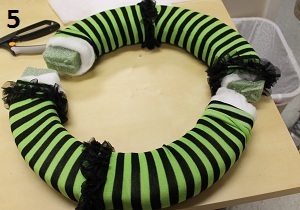 Step 15: Using both hands, firmly press the waistband on the wreath. Refer to the photo to see the best placement. This will allow your tutu to lay properly. Step 16. Glue the back side of the tutu down to the wreath. 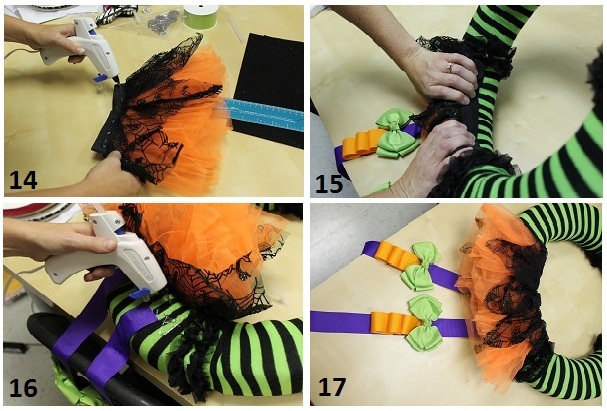 You may also want to glue the tips of the black spiderweb down to the orange tulle so that it all lays flat. Step 17. This is where we are at this point. It's coming together, huh? Now get yourself a hot Pumpkin Spice Latte, grab a seat at the kitchen table, and get ready for the finishing touches! See? Scenery change. This is when you're going to start cutting out your felt accessories. You can find our free printables below. The inside line is to measure and cut your cardstock. The outside line is to measure and cut your felt. Step 18. This step is to for your witch's hat. You'll need to cut a cardstock hat and then wrap the felt hat around it. (Below.) You can pin your template to the felt and cut it out, or you can trace the template onto your felt with a piece of chalk and then cut it out. We pinned ours and it worked well! Step 19. This is the base of the hat. Cut two felt pieces and then sandwich them around the cardstock so the hat has some support. Step 20. 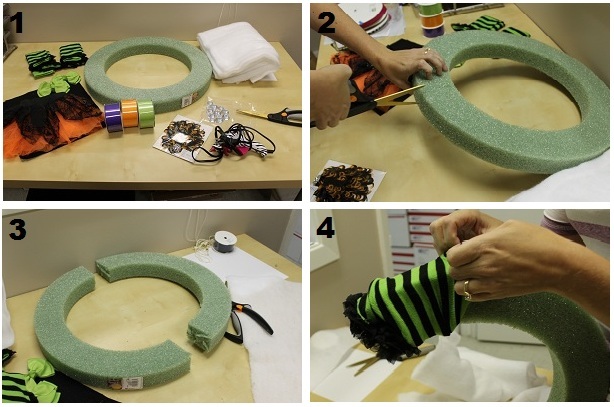 Roll your cardstock to form your witch's hat. Tape it together. Coat the outside with glue (we used fabric glue on this part) and gently place your felt hat cutout on top, be sure to smooth it out. Step 21. Glue the cone portion of the hat down to the brim of the hat. Looks like a hat now! 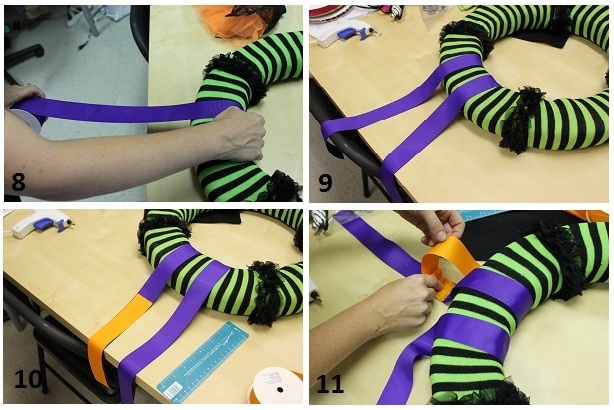 Cut a long length of purple ribbon, roughly two loose turns around the hat. Much like your did with the socks, create a ribbon ruffle around the hat. We opted for a "messier" look with these ruffles. You can do whatever you'd like, just be sure to glue it well! Step 22. Adhere your nagorie feather pad to the front of the hat. Be sure your felt seams are on the back of the hat so that they aren't showing when you attach it to your wreath. Not pictured: this is also the time to attach your decorative rhinestone to the end of the feather pad. Step 23. You'll make the shoes the same way you made the brim of the hat. Cut 4 felt shoes and 2 cardstock shoes. Make two "felt shoe sandwiches" by gluing the cardstock in the middle. Step 24. Glue the shoes to the purple ribbon. Be sure to attach them so that the bottom orange sock ruffle hits the top of the shoe. Once your glue is dry, trim the extra purple ribbon off. Step 25. We didn't take a picture of this, sorry! It's time to glue your witch's hat to your wreath. Your wreath should be sitting up straight so that your hat won't be crooked! Use a lot of glue and hold it in place to make sure it sets. You're done! We added a loop or orange ribbon to ours, but you can hang yours however you'd like. If you are going to attach a loop, make sure it is centered. Cutest thing you've ever seen? Yep! If you make a version, show us photos. Below is your list of supplies.